I was reading a thought-provoking article in a copy of The Spectator (21st November, 2009) by Matthew Parris today about jigsaw puzzles and religion, a train of thought induced by hearing a talk by Dame Margaret Drabble on her book about her aunt and jigsaw puzzles. This led me in rather a different direction, I suppose because of being an artist. Dame Margaret advised starting to do a jigsaw puzzle by getting the outline sorted out first, because the one side with a straight line helps. Parris reflected that if one regarded life's experiences as pieces of jigsaw puzzle, there are no helpful edges that can serve as a delineating frame for putting order and coherence to such situations as religion. However, if one thinks about the jigsaw puzzle analogy for matters artistic, it can be of possible help. First, of course, a delineating frame is always wonderful to use - even by using one's fingers as a frame - to compose a scene if one is trying to decide what to depict. Second, and more intangibly, I suggest that finding the straight-sided pieces first - in art - really is equivalent to sorting out basic technical considerations first before doing any artwork. By that, I mean deciding what medium to use for a work, then what surface - paper, canvas, etc. - what size of image. Composition, the "atmosphere" and, above all, deciding what one wants to convey in the artwork are other aspects of the puzzle frame. The content of a piece of art, as symbolised by the jigsaw puzzle frame, is really the summum of one's experiences in life, one's skills in matters technical, the impact of what moves one to create that image, realistic or abstract. In essence, within that frame, can be contained one's persona as an artist, for good or for bad. Selecting out the "straight-sided" aspects of oneself as an artist can therefore perhaps help in mapping out what one wants to do and achieve. From that frame, the inside, odder-shaped pieces of life and experience can be better organised to make a powerful piece of art. 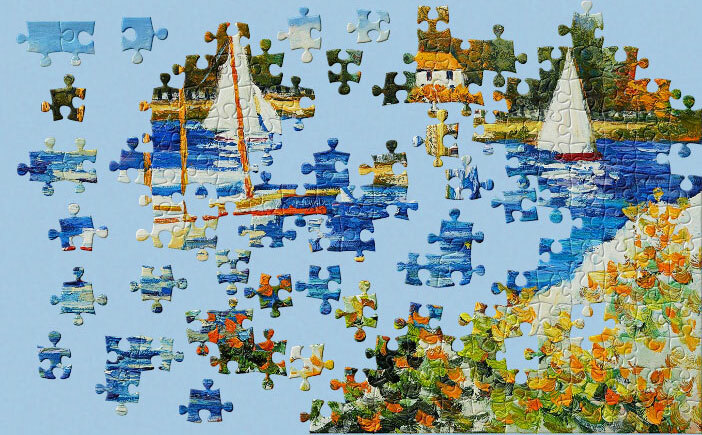 Even the analogy of coloured pieces of jigsaw puzzle can pertain: the artwork can be made more coherent by the choices we make when beginning to work on the frame of the puzzle first. For a realistic artwork, of course, even the source of inspiration - landscape, still life, person, etc. - can help us assemble the jigsaw puzzle pieces within the frame of the conceived artwork. Ultimately, fitting together all the pieces of the puzzle that we artists deal with on a daily basis is just as much a fascinating challenge as any box of complex jigsaw puzzle pieces.